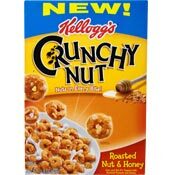 The complete name of this product is Kellogg's Crunchy Nut Roasted Nut & Honey O's. Looking at the box, you might expect this cereal to be like Honey Nut Cheerios with it's nuts showing on the outside. It's not. This cereal has more of a corn base ala Kix Cereal. It stays a little crispier in milk and, for those wishing to stop reading now, it doesn't taste quite as good as Honey Nut Cheerios. It tastes fine... vaguely nutty... a definite touch of honey... just not as good. The thing this cereal has going for it is crunch. The pieces stays crispy in milk for upward of 8 minutes. They manage to soften in the center but retain a crispy exterior. If you like crunch and are ambivalent about flavor, this is a cereal for you. The picture on the box shows individual O's sprinkled generously with pieces of roasted peanut. 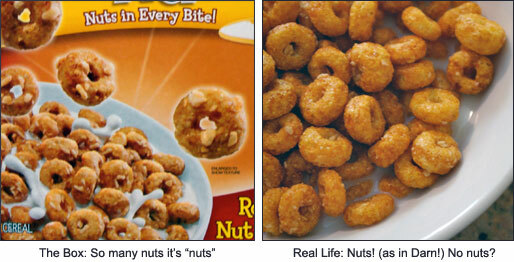 That's not really the case when you examine the cereal in real life (see picture below). The pieces that retained more nuts have a more interesting flavor and it's easy to imagine that this cereal would be better if it was the same cereal shown on the box. Crunchy Nut O's were introduced at the same time as another Kellogg's Crunchy Nut cereal: Golden Honey Nut Flakes. The flake cereal is the better of the two. Bottom line... I'll finish the box and enjoy it, but I'll know with every spoonful that I would enjoy Honey Nut Cheerios just a little bit more. Nutritional Considerations: Each 3/4 cup serving has 100 calories, 1 gram total fat (0 saturated and 0 trans), 23 grams total carbs, 2 grams dietary fiber, 10 grams sugar and 2 grams protein. What do you think of Crunchy Nut O's? My family and I love Crunchy Nut O's cereal. The last time I found it, we bought 6 boxes and that was so not enough. Alas, as in every product I love, it disappeared off the shelf one day never to return again. Why don't they break this curse I have and please bring it back to me. Please be sure the stores in southern Arkansas or northern Texas are the first to benefit from such a wise decision to bring it back. Best ever cereal. I have heartburn problems. 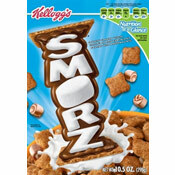 When I would eat this this cereal, my heartburn dissipated. I don't know why it is not available anymore. Where's my relief? This cereal is really good. I like it better than Honey Nut Cheerios. I actually love this cereal. It's sweeter than honey nut and less Cheerio-like. The nuts were kind of a lie but I really liked that about it. It reminds me of Honeycomb cereal with more flavor.